Though there are two types of samphire – marsh and rock – only marsh samphire is widely available. 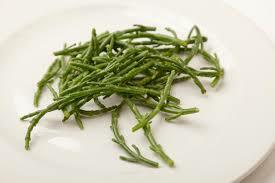 Marsh samphire has vibrant green stalks, similar to baby asparagus, with a distinctively crisp and salty taste. It can be used raw in salad, though it tends to be very salty so it is more often boiled or steamed for a few minutes. It is harvested in small amounts in East Anglia and the South Coast, but may also be found elsewhere – it thrives in marshy conditions. Samphire is threatened with habit loss and rising sea levels, where it’s traditional habitat is being lost, yet new marsh land is not being generated as we seek to protect prime farmland.